The iPad Learning Combo now comes with a FREE One-to-one Mentoring Package for schools comprised of 2 headsets. Get all you need in one go and see your students' speaking skills improve session after session. The iPad Learning Combo is ideally suited to enhance the educational use of tablets such as iPads/learnpads and other media players. This Bluetooth speaker for classroom truly offers you the much needed flexibility to effectively distribute sound in various settings. Use it for one-to-one mentoring, small group sessions or classroom amplification. The iPad Learning Combo comes with an internal rechargeable battery that allows you to use it outside or in areas where there is no access to mains. “At St Joseph's we follow an inclusive practice, so all interventions take place within the classroom, using the combo has allowed children to be more focused when working with the teacher or teaching assistant. Both felt the unit was easy to use and the ability to control speaking and listening was very useful”. You can choose model 43251 if you prefer the blue colour or model 43255 for the graphite version. Help your students progress faster and learn easier through one-to-one mentoring. 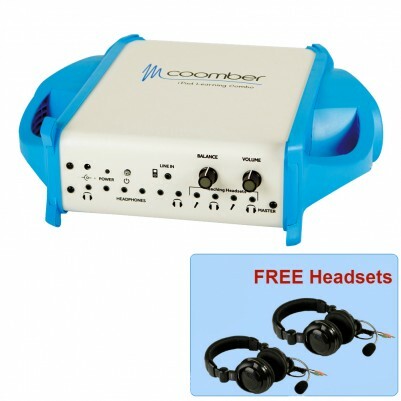 The iPad Learning Combo is a Bluetooth speaker for classroom that allows you to plug in 2 headsets (one for the teacher and one for the student) and communicate through the built-in headset mic. The headsets help block distracting sounds and noise while also providing a safe environment where the student can make mistakes without fear of failure but being positively supported, nurtured and encouraged. The iPad Learning Combo comes with 2 built-in headset sockets. Using the headsets allows the teacher and pupil to converse discretely and without ambient noise distractions, even in a noisy environment just like a normal classroom. Using the headsets they allow even the slightest of the audible sounds of the teacher and pupil to be heard clearly and precisely without straining. This same process can be used to assist reading, by listening to the pupil read aloud immediate and positive guidance can be given boosting there vocabulary and confidence. The unit has a Bluetooth receiver built in so you can connect it wirelessly to iPad, Tablet or computer. Imagine a table with upto 8 pupils reading along to a book whilst listening to the audio book that is transmitted from your desk, you can keep track of where they are. The unit can connect to any audio source either by Bluetooth or a standard headphone connector jack, this will let you make any audio source into a listening centre or just amplify it to the class. Designed with a functional and compact shape, low weight and high sound quality, the iPad Learning Combo is ideal if you are looking for a Bluetooth speaker for iPads. Simplicity of use, reliability & durability. You can choose model 43251 if you prefer the blue colour or model 43255 for the graphite version.